Hilton Hampton by Hilton brand, the global mid-priced hotel that serves value-conscious and quality-driven travelers around the world, today announced the opening of its newest property, Hampton Inn & Suites by Hilton Olympia Lacey. The 121-room hotel joins the Hampton by Hilton family of Hampton Inn by Hilton and Hampton Inn & Suites by Hilton hotels. 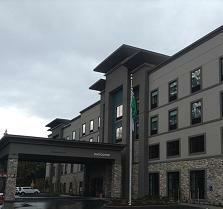 Located at 4301 Martin Way East, the new hotel is managed by Ameritel Inns. The hotel is near the Washington State Capitol and Priest Point Park. Guests of Hampton Inn & Suites by Hilton Olympia Lacey can enjoy touring regional brewery, Fish Brewing Company, and the Woodward Bay Conservation Area. The hotel provides a fresh start to each day with On the House hot breakfast which includes eggs, oatmeal and waffles. In addition, the hotel provides Hampton’s On the RunTM Breakfast Bags filled with a multi-grain bar, an apple, an artisan breakfast bread loaf and a bottle of water with a flavor packet for those guests on the go, available Monday through Friday. Hampton Inn & Suites by Hilton Olympia Lacey offers amenities, such as free Wi-Fi, a 24-hour business center with complimentary printing, a 2,400 square foot meeting space that can accommodate up to 150 people, an indoor heated saltwater pool and spa, a fitness center and an outdoor patio with fire pit and gathering area. Each guestroom includes high-quality amenities, including the brand’s signature Clean and fresh Hampton bed®, 42″ LCD TV, microwave, refrigerator and coffeemaker. Inviting suites are also available, offering additional space and a comfortable sleeper sofa. Designed as an extension of the guestroom with a variety of seating and lighting options for both leisure and business travelers, the new hotel features the Perfect Mix Lobby. Within the lobby guests can find Suite Shop, a food and beverage shop filled with snacks, toiletries, local merchandise and drinks for purchase. Each guest is guaranteed to be satisfied with every stay, or they don’t pay, and that’s the 100% Hampton Guarantee®. Hampton by Hilton team members proudly exhibit a unique culture described as Hamptonality. This term describes each hotel’s approach to friendly customer service and anticipation of guests’ needs and providing travelers with helpful suggestions about area attractions, historical facts and fun things to do around town. Hampton by Hilton hotels are infused with local photography and artwork, highlighting each property’s connection and support to its own community. Hampton Inn & Suites by Hilton Olympia Lacey participates in Hilton’s award-winning customer loyalty program, Hilton HHonors®. Hilton HHonors members who book directly through preferred Hilton channels have access to benefits including an exclusive member discount, free standard Wi-Fi, as well as digital amenities that are available exclusively through the industry-leading Hilton HHonors app, where HHonors members can check-in, choose their room, and access their room using a Digital Key.